The first thing to consider when thinking about your Trade Show & Exhibit Graphics, is what type of material would you like; rigid substrates, flexible roll-able graphics, or soft goods such as fabric. A lot of this will depend on the type of exhibit hardware you will be using. Your PSP (Print Service Provider) will ask you questions about the size, application, and your budgetin order to best determine the right material(s) for you and what will yield the best results for what you are looking for. Other factors that may influence the material selections are Pantone Matching Colors specified (not all materials print the same), apparent resolution desired, texture wanted, reflectance concerns, and longevity of the graphic and the output devices available to the PSP. A PSP with a wide variety of in-house output devices will be able to offer you more choices and hence provide you with the solution for your application. 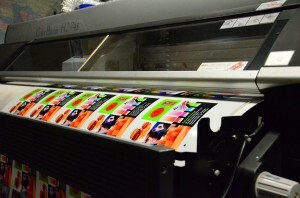 Once the materials have been chosen this will dictate which output device will be used for printing. The output device controls the resolution and process type ie; Photo, Dye-Sublimation, Solvent, UV Curable, UV Pigment, Latex, and Aqueous Ink. Output devices are limited to the maximum print width they can handle as well as printable material choices they can accommodate (materials can be printed only on certain machines). Trade Show Graphics can be printed directly to substrates (DTS) on clear, translucent and opaque materials or can be Dye-Sublimated onto a wide variety of fabrics or printed as continuous tone images photographically, as well as imaged onto banner vinyl, Paper, Film, Adhesives, and more. Find a PSP who offers a full range of these materials and output devices in-house. Printing widths can go up to 16 feet wide creating enormous trade show and event backdrops.